San Francisco wears its health badge proudly. We have enough kale salads, organic juice bars, and pilates reformer machines to make even the most hard-nosed CrossFit fanatic weep vitamin-laced tears of joy. But we also have a sinister, exciting underbelly - we can be deeply unhealthy (licks lips with glee). Case in point - our burgers. 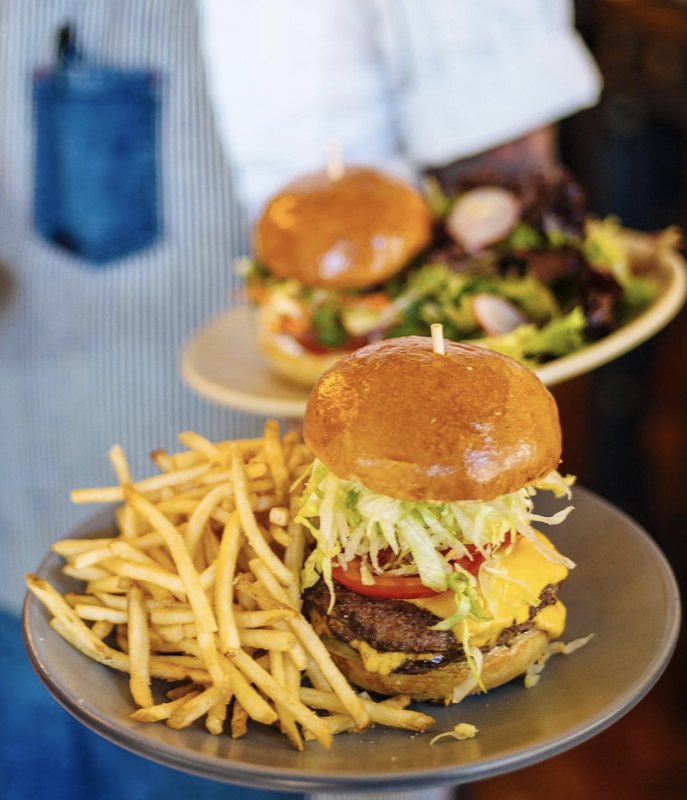 From double-deckers served in greasy paper bags to patties made from organic, free-range, multilingual cows who breathed their last breath overlooking the Pacific Ocean while the farmer recited poetry, SF is home to many excellent burgers. We’ve scoured this city (i.e. eaten our weight in meat sandwiches) looking for the real standouts, so you won’t ever waste your time on a mediocre burger again. 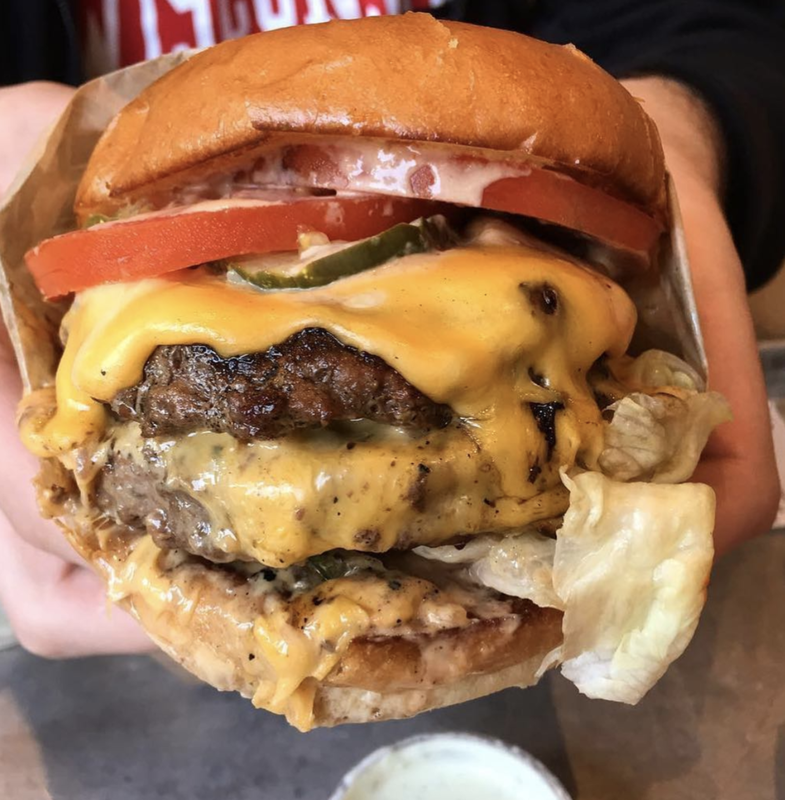 Here are the 18 best burgers in San Francisco, ranked according to extensive research and analysis (a.k.a. multiple episodes of meat sweats). Sometimes you want two things at once, like a diamond ring wrapped inside a Lamborghini. Bringing the fantasy down but only slightly - Causwells’ brunch burger is the ideal vehicle for having your eggs and bacon while eating a burger too. Yes, a brunch burger is taking our number one spot - and for good reason. The combination of perfectly-fried egg, crispy-but-not-burnt bacon, high-quality meat, and super-melted cheese is incredible - and that counts double if you keep one foot firmly planted in Marina mode and add avocado. Garaje's Drive-In Burger is a nostalgic, juicy classic. Served with a single or double patty for those with particularly large mouths and appetites, this one's gone from-off-the radar in terms of burger acclaim, to full-on hype, so get after it quick, before the line stretches all the way to the field they got the beef from. 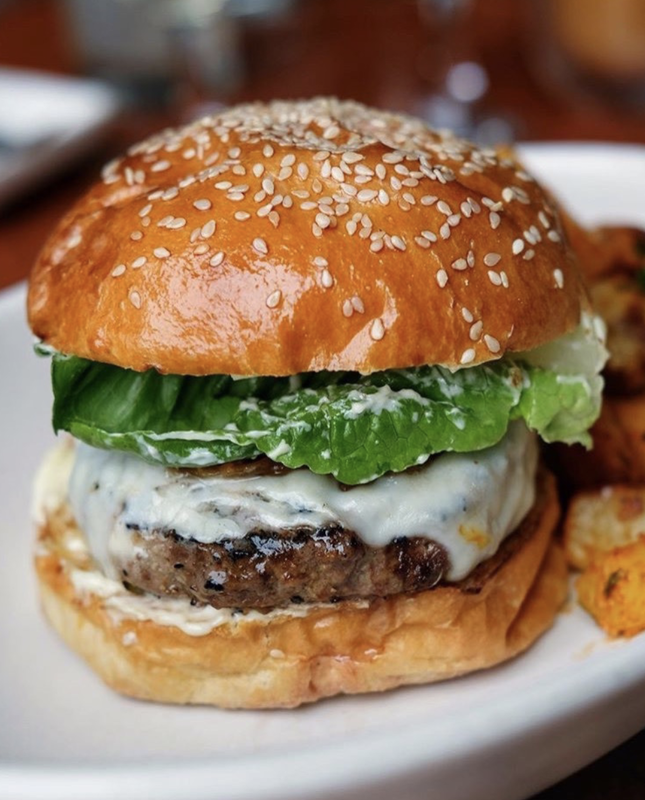 Unlike the Google+, the burger at Nopa actually lives up to its reputation. We’d even wear it on our wrists forever if we could, or at least until a family member staged an intervention. Anyway about the burger: the beef is excellent, the bun is buttery and toasty, and the pickled onions are a nice touch. It’s simple and perfectly done every time. We’re also pretty down with the side of cripsy french fries and spicy mayo dip that comes with them. When Anthony Bourdain filmed an episode of No Reservations in San Francisco, his final stop was for a burger at Red's Java House. Staring meaningfully into the camera, Bourdain proffers his decidedly downscale burger and proclaims, "This is the antidote to Alice Waters." Regardless of the pedigree (or quality) of the burgers at Red's Java House, it's easy to see why a producer would want to get the place on TV. 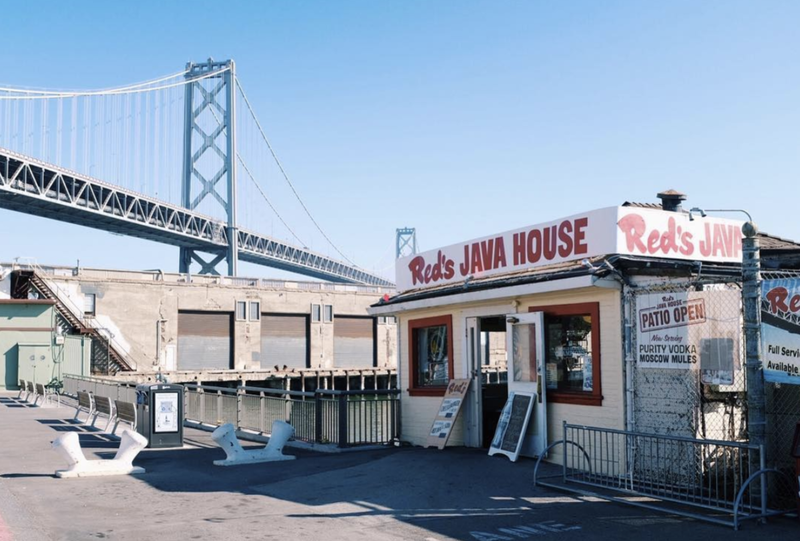 On a pier that juts out into the Bay, Red's looks like the tiniest of shacks from the outside. Inside, the long, narrow restaurant space sports an old-school menu board and vaguely off-color memorabilia (e.g., a mug shot of Patty Hearst). The concrete-floored seating area out the back has views out over the water—loading docks framed by the Bay Bridge. In keeping with its Bourdain-approved edgy character, the burger at Red's is basic stuff. As a sign under the menu makes clear they won't even give you lettuce and tomato. The thin patty, a quarter-pound or so, is adorned only with a few lonely pickles and some roughly cut chunks of onion. Standard yellow mustard comes pre-applied, and if you order the cheeseburger, it's a slice of deli cheddar. 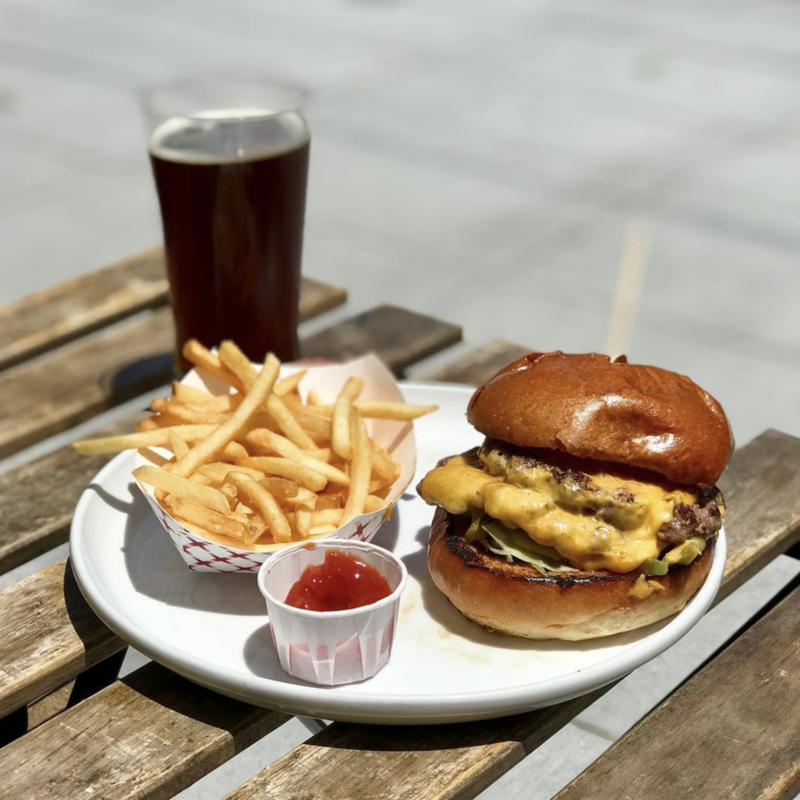 In a San Francisco touch, Red's places its patty on a length of generic sourdough bread.It's chewy, tangy, and thick—certainly more than a typical burger can handle, though Red's remedies this somewhat by hollowing it out. Did I mention this burger is under $4? Ok, so I definitely came here for the Instagram worthy wallpaper...but I stayed for the burger (that chef Dante Cecchini only serves on Tuesdays). Previously at Marlowe, Cecchini couldn't alter the infamous winning burger formula, but added his own twist. Cecchini has substituted a secret,1000 Islands-inspired sauce for horseradish and good old-fashioned (and good quality) American cheese for high-end cheddar, a great complement to a 6 oz. B&N Ranch ground beef patty served on a poppy seed bun with sour pickles and grilled onion. You need this burger in your life. Trust. Mixing bitters (yes, the ones in your cocktail) into a burger patty sounds like a gimmick. But if that’s why this thing tastes so good, we’re all for it. The Muenster cheese is nice and melty, there’s a layer of housemade pickles at the bottom, and they always cook the patty just how you asked for it. If you come in during happy hour (weekdays from 5:30-6:30pm and 10:30-11:30pm), you get a free beer with your burger, which is like bribing a kid to eat an ice cream cone. Well done Maven, we’re off to add bitters to everything now. Lets see if it works on chocolate cake. 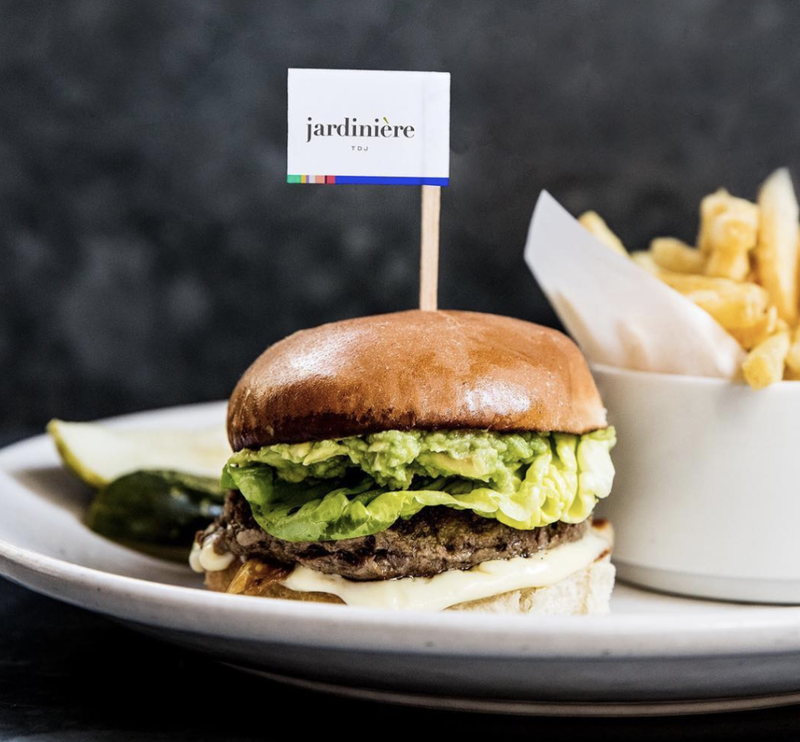 Jardinière chef/owner Traci Des Jardins is a consulting chef at Impossible Foods, and has developed recipes for the burger, settling on a version topped with avocado slices, mashed avocado, caramelized onions, tomato, gem lettuce, and vegan dijonnaise on a potato bun. Are you a vegetarian who has somehow stumbled across an article on burgers? Have no fear. 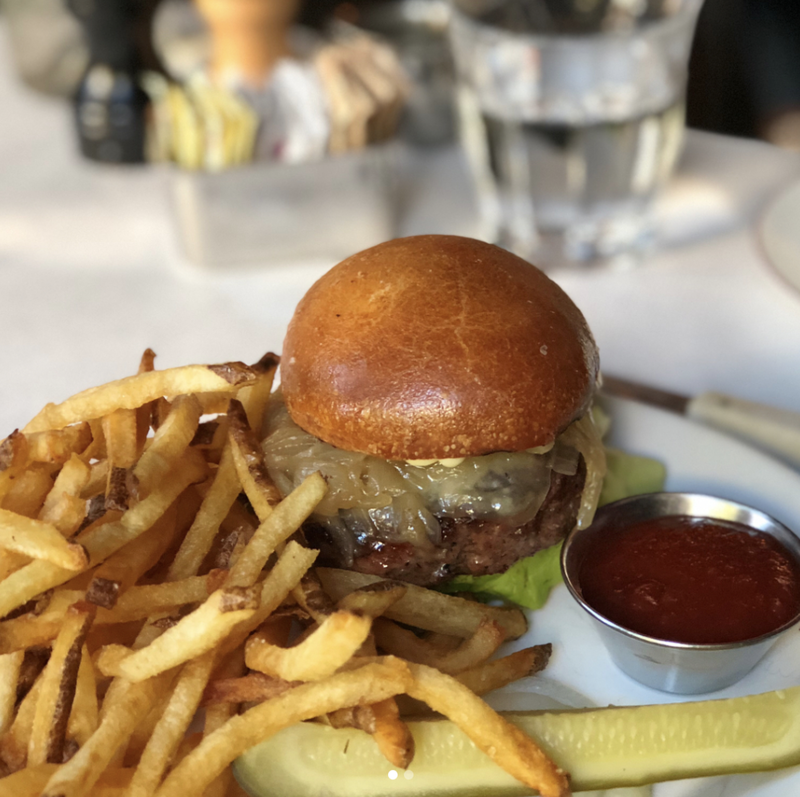 Traci Des Jardin’s connection to the company makes Jardinière one of the first restaurants in the city to feature the meatless bleeding burger, and it's now a permanent addition to her menu in the bar and lounge daily after 7:30 p.m. for $16. It’s an act of confidence to name a burger the Best Damn Grass-Fed Cheeseburger, especially at a barbecue restaurant, those steely-balled mavericks. And while it might not quite be the best burger ever, it comes very close - every aspect of it works. The bun is probably (definitely) buttered, there’s just enough gruyere, and the sauce ties it all together. Get the double and add an egg and bacon if you want, but this one is pretty great au naturel. Also of note for when you’d prefer not to move: this burger travels extremely well (takeaway, not a trip to Venice). At Monsieur Benjamin there’s only one burger on the menu, but with a name as fancy as this restaurant’s, anything else would be too over the top. Despite really just being a patty and a bun, they describe their burger as “fully dressed.” We can only assume they mean dressed in flavor - this is one of the best burger patties you’ll find. And it can stand on its own without any unnecessary frills. Mademoiselle loves it. OMG. So, it's no secret I'm a sucker for asian fusion anything. Comstock chef de cuisine Jason Raffin is the mastermind behind some of the city's best burgers (i.e. he consulted on the incredible Finn Town burger), but this creation at the SF classic, Comstock Saloon, could be his best work. 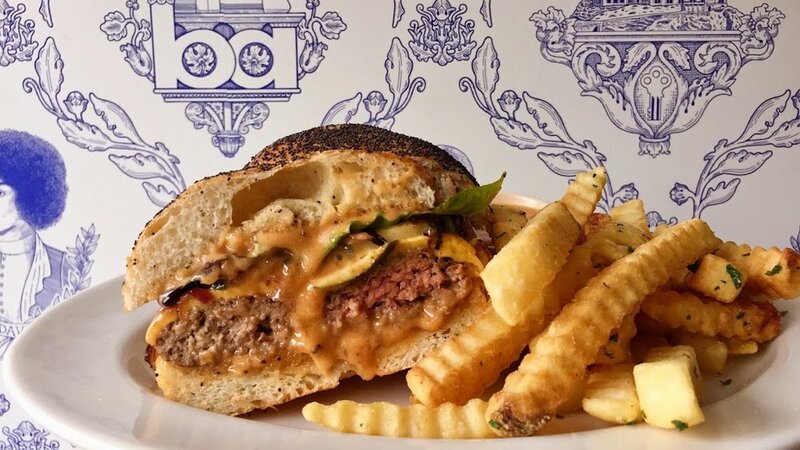 It’s a six-ounce house made beef patty ground, served on a nori and togarashi seeded bun (also baked in house), and piled high with secret sauce (that's brings all the boys to the beach, North Beach that is), cheese, pickles, and malt vinegar chips for a memorable crunch. 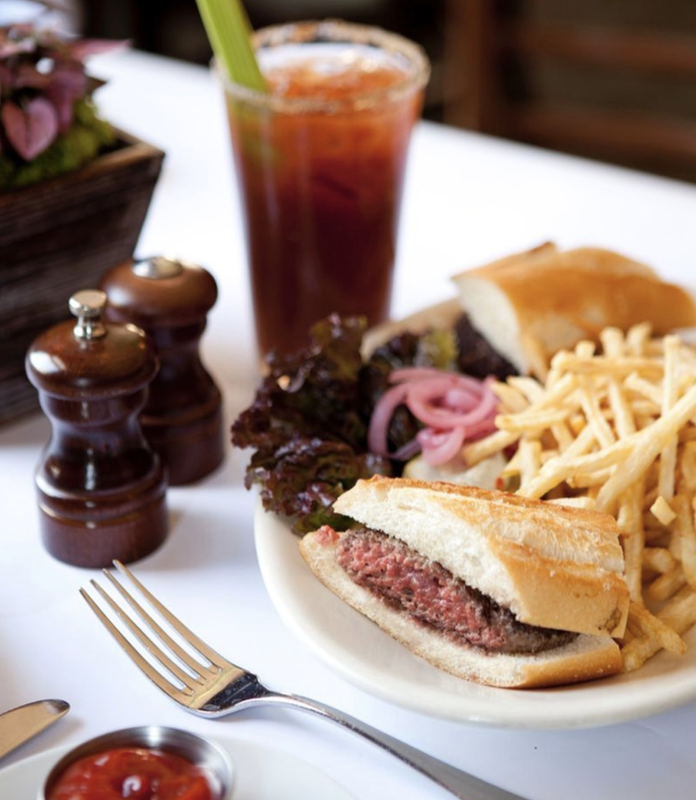 The burger at Zuni is organic, grass-fed, Ivy League-educated (we presume), and an all-around high achiever. It comes on rosemary focaccia bread and is topped with Vermont cheddar - all of which is a mouthful to say, but an excellent mouthful to eat. Zuni also has hands-down the best fries in the city, with potatoes probably harvested from an English rose garden, so definitely order them as a side. 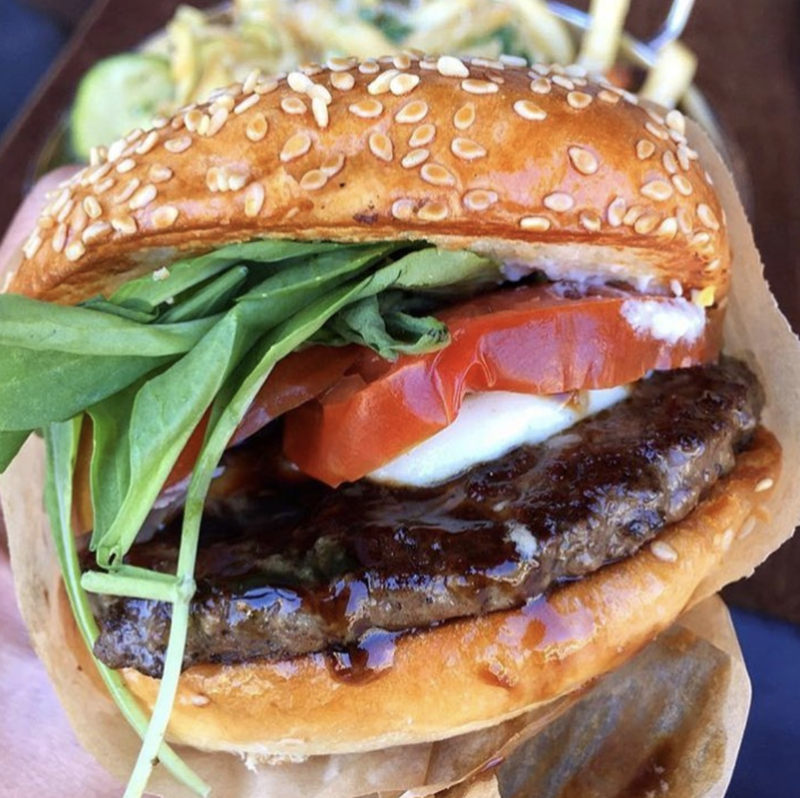 The Lee brothers' burger is an indulgent, addictive addition to this list, starting with two thin Marin Sun Farms meat patties cooked on binchotan charcoal, which adds a true wood-grilled flavor. Next up is bacon jam, made with Benton's bacon and Four Barrel coffee grinds, with heirloom tomatoes and pickled daikon from the Namu farm, all on a pillowy bun. Sounds like heaven? Tastes quite like it too. If heaven was a burger that is (we hope there’s more up there than that). The Brass Hat Burger at Southern Pacific has some slightly fancy toppings (pepper jack cheese, caramelized onions), but it’s the use of pickled jalapenos and sweet chili sauce that really sets this one apart. It’s sweet, savory, and spicy all at the same time, ticking every tantalising box in town, and we’re never not ordering it when we come here. Shredded lettuce, a big tomato slice, and melty American cheese make this essentially an upscale In-N-Out burger, and we mean that as compliment. You’ll want to complete the fast food journey by eating the mountain of McDonald’s-esque fries it comes with. Not that you needed us to tell you that. Of all the burgers on the list, Sam’s is likely to be held closest to San Franciscans’ hearts. Though not necessarily the most awe-inspiring option, the Sam’s burger is essential to San Francisco, and is as rich in history as it is in taste. Sam’s first opened its doors in 1966 and has been serving up comfort food — daily until 3 a.m., which is the key part — ever since. It's a chuck blend from Quality Meat Company with cheese, lettuce, and tomato on a sesame bun. Go after a North Beach night out, and you'll soon be a Sam's disciple, too. Spruce is a fancy, white tablecloth kind of place. But their bar is much more low-key, and it’s also the only place you can get their phenomenal burger (they obviously don’t want to get their tablecloths dirty). An English muffin as a bun normally isn’t our first choice, but Spruce gets away with it without any McDonald’s McMuffin vibes, because the patty is massive and the beef is super high-quality. Toppings (the standard lettuce, tomato, pickled onions, and mayonnaise) come on the side so you can dress your burger as you see fit, in a ballroom gown of Romaine, or keep it warm with a Jersey tomato. Roam has every type of burger you could possibly want, but the French & Fries with a bison patty is our personal favorite. The meat is the perfect balance of lean and fat, and the avocado, gruyere, and truffle fries are all sandwiched between the sesame bun. Don’t say we didn’t warn you — decadence awaits. Wesburger started as a pop-up, eventually garnering such a fan base that it went brick-and-mortar this year, which is great because we don’t want them to ‘pop-off’ anytime soon. Now the Mission location is making its signature six-ounce brisket patties on a nightly basis, and toppings change every day. The most classic version is the okie burger, which is cooked on a bed of onions and comes with mustard, pickles, and American cheese. This is the burger that studied abroad in Paris and came back to the US wearing a beret. It’s served on a baguette, which definitely feels weird at first. But that baguette-as-bun move also results in something that tastes like a grilled cheese melted around a burger, which is as good as it sounds. You’re belly will be murmuring “merci beaucoup” afterwards. When the cheese on the burger is melted to a liquid state and covers the whole thing, it’s a good sign that the people making it know what they’re doing, or that they forgot to turn the grill off, but the delicious taste points to it being the former. The double cheeseburger at Popsons involves American cheese, two thin-ish patties, a soft and toasty bun, pickles, lettuce, and sauce. The fries are a little hit or miss, but the burger is excellent. Kitchen Story’s Millionaire’s Burger is the ideal hangover burger. And is also frankly ridiculous. It involves a maple syrup patty and brown sugar-dusted bacon, and is topped with a cheddar that will instil a profound sense of respect and admiration for the many gifts Vermont has bestowed upon us. Go wild at night and sooth your battered soul here the next day. The only appropriate beverage to consume with a burger is beer. Except for maybe a milkshake (MENTAL NOTE: create beer-flavoured milkshake empire). Any place with 200 beers to choose from needs to serve a burger, and the one at Monk’s Kettle is awesome. The onion jam and gruyere make it feel a little fancier than your normal meat sandwich, and it’s never overcooked. Hop salt fries come with it, and have taught us that hop salt fries should be served everywhere. They've also got an incredible vegetarian burger - black bean & quinoa burger with sweet potato spread, pickled onions, frisée and vegan aioli. Are you vegan? No problem, they'll substitute their egg bun for Acme Levain to make your egg-free, meat-free, dairy-free dreams come true. While it’s slightly confusing that a mezcal bar serves both a cheese plate and a burger, we’re not complaining because they do a stellar job at burger-crafting. Juicy is the only appropriate word to describe this creation of meat, gouda, and caramelized onions. We’re also strong supporters of the potato bun, which is the only potato-adjacent item here - and perhaps the sole indication that this is nominally a Mexican place, other than the Mezcal, is that there are no fries on the menu. The Marlowe burger is so popular that for a hot second it inspired its own pop-up restaurant. 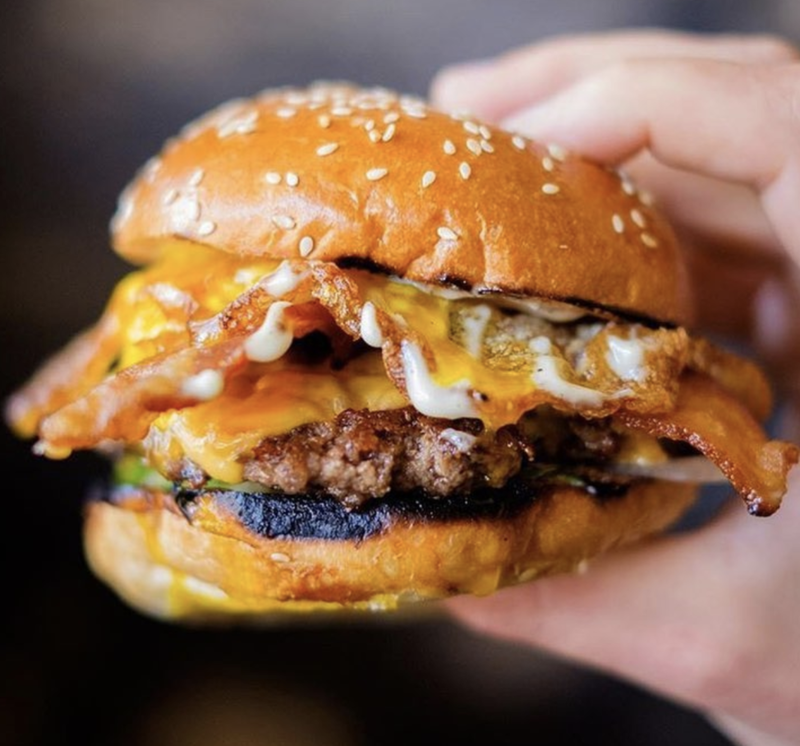 Chef Jennifer Puccio created a burger masterpiece using a six-ounce ground beef and ground lamb mix, chargrilled and topped with cheddar cheese, caramelized onions, horseradish aioli, bacon, and shredded lettuce, all on an Acme bun. The lamb adds a subtle earthiness, while the horseradish brings it all alive (not literally, don’t worry it won’t moo). Gott’s is the perfect burger spot when you’re in the mood for fast food but don’t want to sacrifice taste or quality. TBH this is one of my favorite places to indulge and it's not just because they have hot dogs on the menu. The California Burger has a fried egg, swiss cheese, mayo, and bacon that is on the correct side of crunchy. They also have everything from patty melts and Texas inspired burgers (dripping in BBQ sauce) to Bulgogi burgers. Go when you’re near the Ferry Building or don't feel like venturing out of the city (or the Fisherman's Wharf) for IN-N-Out. The Black Sands Burger is simple. The double comes with two patties, American cheese, and their special sauce, but what it may lack in complexity it makes up for in solid execution. On those nights when you just don’t want to think about what to eat, head here, get this burger, and leave happy.